Like years past, my son and I decided to make a few gifts for Christmas this year. Just to ensure that we have the maximum amount of time relaxing and not stressing over things that need to be done. My project was to build a backsaw to give to my brother-in-law. You’ve seen the previous posts, there wasn’t much more to write about that project. I spent way too much time brushing Shellac on the handle. In retrospect I should have sprayed it with lacquer or just used an oil finish. I didn’t want to overly darken the color of the wood and I thought clear Shellac would be the ticket. Mostly it was just fussy and imperfect. Once the handle was smoothed it was a matter of setting the teeth, sharpening and assembly. Voila! Making the handle was 90% of the work in the project, and getting the finish on it was probably half of the work by itself. Next time I’ll do the finish differently, brushing Shellac, sanding and brushing more is not my idea of fun. 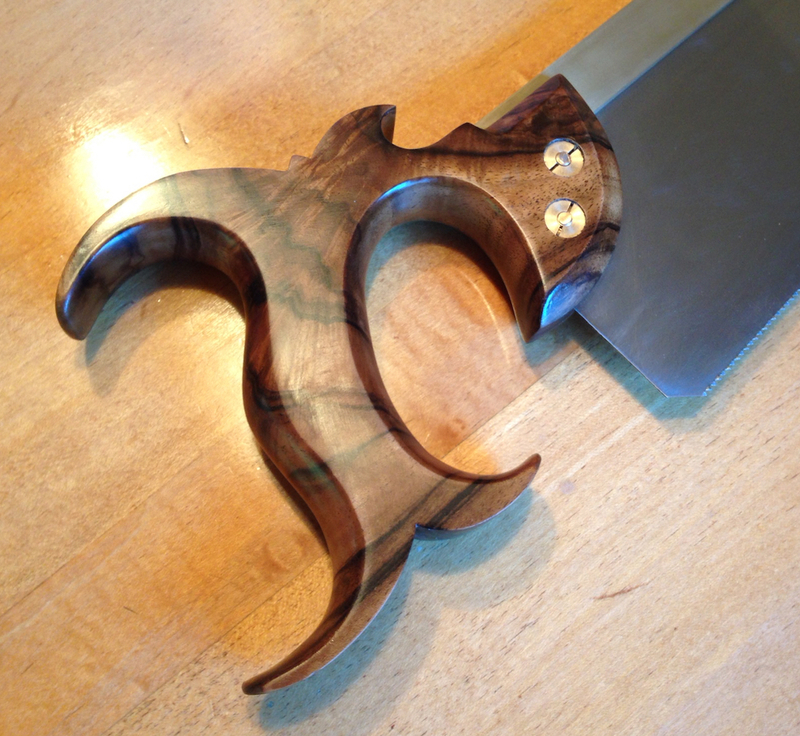 Finished handle. I’ll give it an “A” on shaping and a “B” on finishing. I was going to straight A’s, but but sometimes there are trick questions on the final you can’t anticipate. The most important thing is how does it work? It’s extremely comfortable in my hand. I built it with the idea of being a general purpose joinery saw for building furniture. I think it should work really well for cutting tenons and dovetails. I made several practice cuts and the saw tracks absolutely straight, cuts crisply and leaves a smooth surface finish. I’m very pleased with how it works. 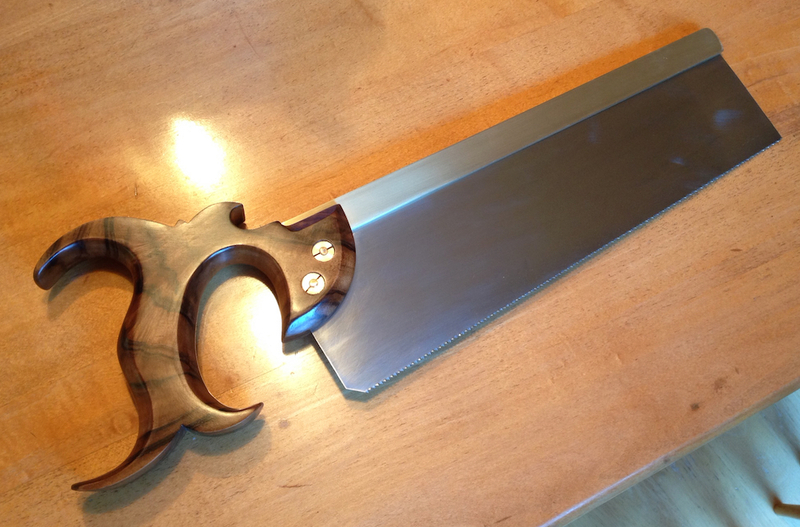 I’ll need to make myself one of these — it’s hits a nice sweet spot between my dedicated dovetail saw and my dedicated tenon saw (which is actually too coarse-toothed for my taste). My son has been hard at work building a chess set. All of the individual pieces were scroll sawn, first from the front view then from the side view. I’m proud of him for sticking with it, some of the cuts were tricky and the wood we used was barely big enough for the pattens we found online. For finish we soaked them in a brew of equal parts Mineral Spirits, Boiled Linseed Oil and Poly. I made the board, which was just a lamination of 1 3/8″ wide strips that I then cross-cut and re-glued with every other one flipped. 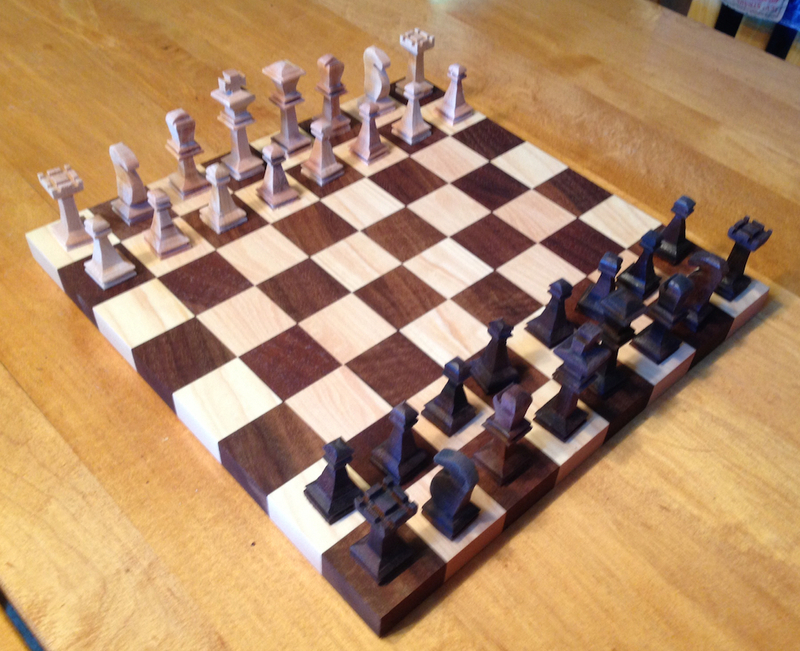 The completed chess set. I’m impressed, I think my sone did a fantastic job on this…not even counting that he’s 14. 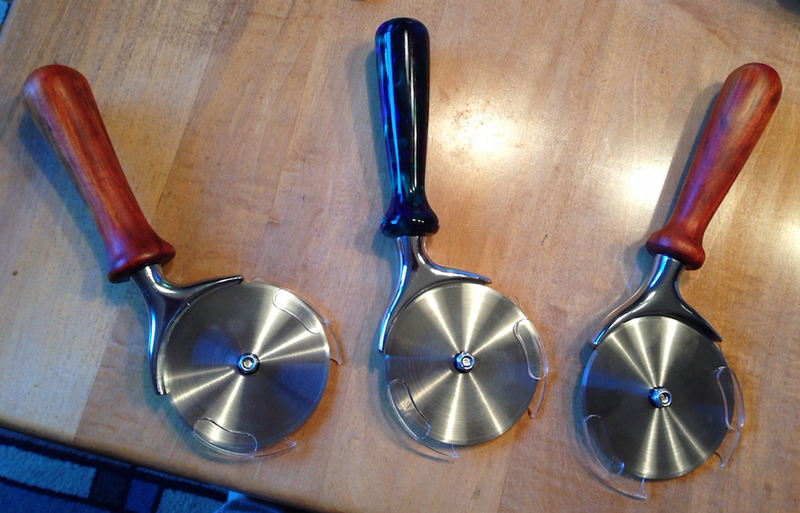 The final project was a batch of pizza cutters. The cutter mechanism is something I picked up at Woodcraft, along with some “acrylic turning blocks”, or as we like to call them “demon-spawned torture devices”. 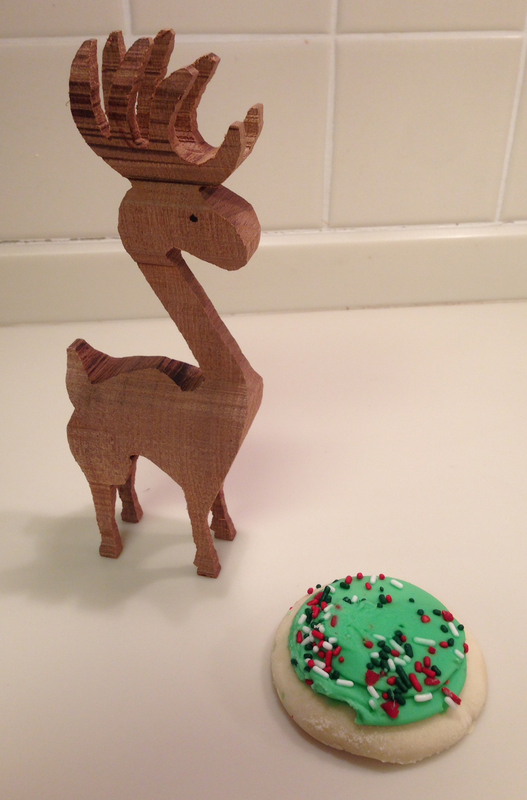 The are decidedly un-fun to turn, we switched to wood after the first one. They smell like plastic when you’re turning them of course, and are really prone to grabbing the tool, chipping out and spraying hot plastic chunks everywhere. Sanding wasn’t much fun either — with the finer grits it will re-melt the dust onto the handle and you have to drop back to a coarse grit to remove it. Never. Again. I had to help with this one when Kolya ran into problems, but it’s still mostly his work. Once he had it sanded to 1,500 grit I took it to the buffer and polished it. We used some Chakte-Koc to turn the other two handles. It’s still damp so it was an absolute joy to turn. As it dries out it will darken to a deep red-orange. The finish is Tried & True Oil/Wax mix. So I’m done with all of the projects that have been going on in the shop. What to do now? Love the chess set, nice work. All of these gifts look wonderful Joe. Great job all around. A blow to crass commercialism and fantastic gifts with a personal touch and story. That boy of yours did an awesome job! I hope see some more from him. 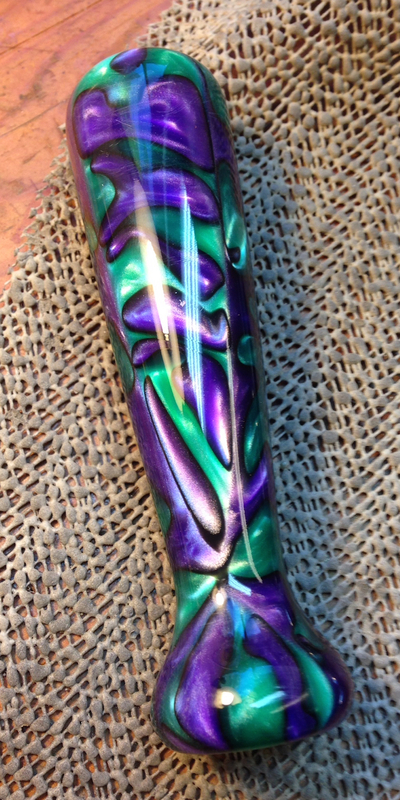 Mike Wenzloff turned me on to Behlen Qualasole for saw handles. Its what he uses and its a wipe on. I think they have it at Woodcraft.